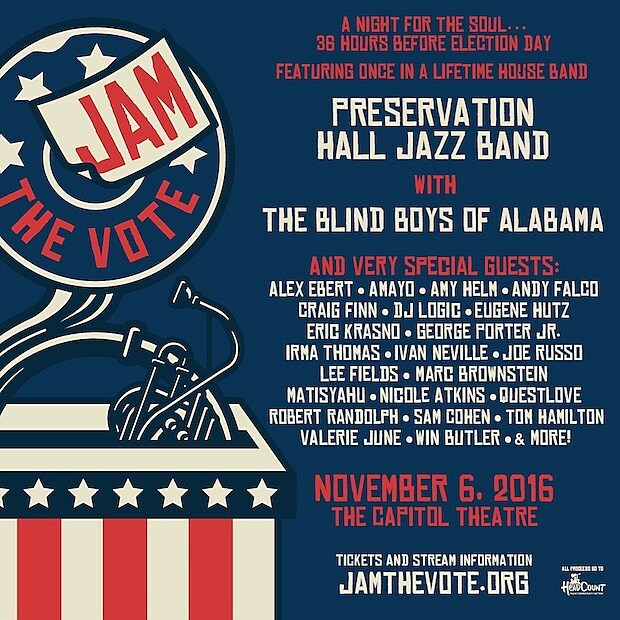 This Sunday (11/6) at Port Chester, NY’s Capitol Theatre is the ‘Jam the Vote’ concert, where house band Preservation Hall Jazz Band featuring The Blind Boys of Alabama will be joined by Craig Finn, Eugene Hutz, Lee Fields, Questlove, Valerie June, and many more. That show just got a very exciting additional guest: Arcade Fire frontman Win Butler. Updated lineup on the flyer below. Tickets are still available. If you’re not going to the show, you can stream it live as long as you pledge to vote. The show starts at 7 PM. Pictures of Arcade Fire’s recent set at Voodoo fest are in the gallery above.